Book cover and author, Sherman L. Turner. 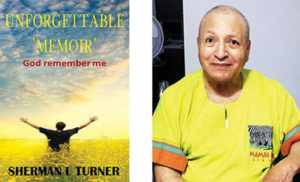 BUFFALO, NY (BlackNews.com) — Sherman Turner’s gripping memoir, Unforgettable ‘Memoir’: God Remember Me, describes his experience as an African American plumber who faced discrimination for hiring minorities. Upset by Turner’s actions, the white contractor he worked with retaliated by making several death threats and even told him he had a contract on Turner’s life. The stress of this situation caused Turner to suffer a stroke leaving him 99 percent paralyzed. When he came out of the coma, he was unable to move, walk, or talk, and suffered partial memory loss. Now he remembers saying, “God remember me.” The hospital told him he could never walk or talk again. He soon went home helpless and in a wheelchair. After losing his wife he wanted to start rehabilitation training. He found out that his wife took all the money from his business and personal savings accounts. Soon his wife filed for divorce and he also lost his home. With death threats still looming, Turner sought some place safe and faraway for his rehabilitation. Turner’s life changed forever when he visited Kenya and learned about Obama in the rehabilitation facility. Kenyans told Turner stories of Obama to help his training. The book answers two questions: Would his full memory ever return? How did Kenyans train him?